Clevedon is a fashionable Victorian-esc seaside town with a charming and sedate atmosphere. Its low cragy coastline includes many fine shingle beaches and a lovely west facing cliff-top promenade. Ideal for a bracing stroll or to just sit and relax and take in the spectacular views across to the Welsh coast. The lack of a railway terminus has prevented the town from being overdeveloped, resulting in a pleasant little resort with very few of the modern gaudy attractions associated with other busy seaside towns. Clevedon's half-mile of seafront, which runs from the pier to Salthouse Field, includes ornamental gardens, a Victorian bandstand, bowling green, tennis courts, crazy golf and a small marine lake. There is also an excellent range of guest houses, shops and restaurants, including several fine traditional pubs. Clevedon's pride and joy is its elegant Victorian pier that stretches far out into the Bristol channel. The pier is popular spot for fishing and boat trips, which are available from the pier-end during the summer months. Clevedon's small town centre includes a 19th-c. market hall, a Victorian clock tower and a 1920's Curzon cinema. Churches include the Medieval St John's parish church and the partly Norman St Andrew's Church, located beside an un spoilt headland at the south-west end of the town. Just a few miles from the town is the fine 14th-c. manor house, Clevedon Court; home of the Elton family since 1709. The Eltons were gifted merchants and scholars who were instrumental in the development of Clevedon as a popular holiday destination. Just to the north of Clevedon is Ladye Bay, a beautiful rocky cove backed by downs. This area makes for very pleasant walking and a popular coastal footpath called 'Lovers Walk', starts at the top of Marine Parade and leads on to Ladye Bay. In fact, Cleveland's coastal walks have inspired many great writers over the centuries, including Tennyson and Coleridge. In celebration of this another popular trail, known as Poets walk, runs along the main promenade and around Wain's Hill to the south of the town. The remains of an iron age fort stand on the top Wain's Hill, where there are some lovely views over the town and across the Somerset levels. Clevedon's elegant wrought iron pier is a classic landmark and the only fully intact Grade I listed pier in Britain. 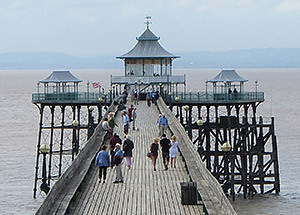 The view from the pier end is splendid, providing spectacular views all the way from Weston-Super-Mare to Wales and the Severn Bridge. The heritage centre (at the entrance to the pier) displays a range of exhibits about Clevedon's history. The pier was built in 1860 from the iron rails intended for Brunell's fated south-west railway. It partly collapsed in the 70s but has now been fully restored to its former glory. During the summer visitors can board one of the last few surviving sea going paddle steamers from the pier-end. Visitors to the craft centre can see a variety of crafts-people at work, located in the buildings of a restored 17th-c farm. Trades include cabinet making, weaving, leather working, glass blowing and engraving, silversmithing and porcelain making. The Salthouse Field has a children's play area and light railway that runs around its perimeter. 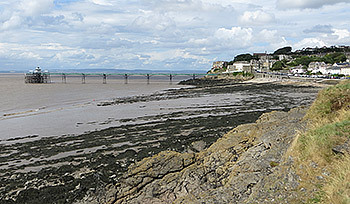 Clevedon has close links with the poets Tennyson, Samuel Taylor and Coleridge. In fact, Coleridge came to Clevedon for his honeymoon and loved is so much he stayed for two months. The trail starts at the promenade and covers 3 miles of pleasant coastline backed by down lands.